San Marcos is a small town located 25-30 minutes South of Austin, TX. It is mostly known for being a college town for Texas State University. Don't let that fool you though, there are some really beautiful spots that are fun for the whole family! All information was provided by San Marcos local, Tiffany, from The Hahnest Life. 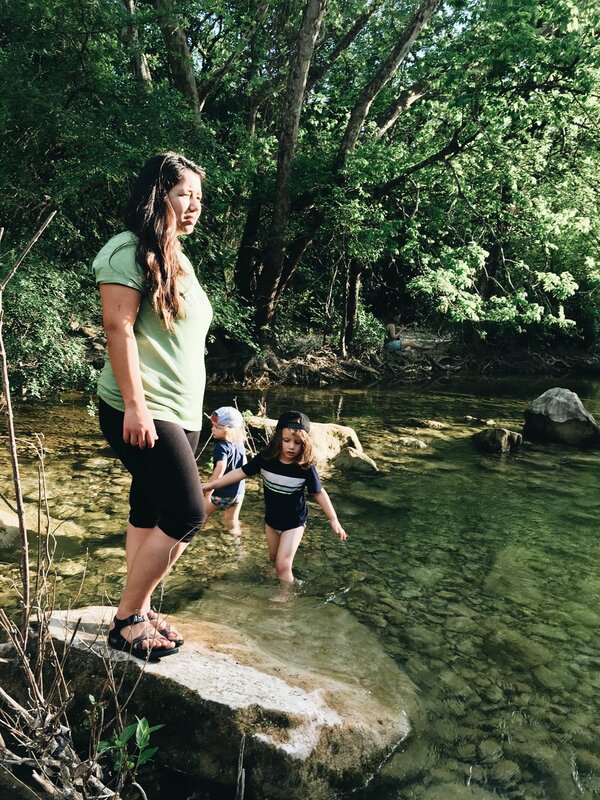 Her and her family of five live an adventurous, outdoor life in Texas and have shared all their insider tips on the best things to see, do, and eat while visiting their hometown. 5 Mile Dam- The Blanco River a beautiful river with a large grassy area great for family picnics. Purgatory Creek- Hiking and trail runs located in a beautiful wooded area that is perfect for kids and furry friends. Barton Creek Greenbelt- Beautiful hiking and biking trails along with a creek with water so clear you can see right through it. After hiking and playing be sure to fill your bellies with some scrumptious local dining! The Root Cellar in San Marcos, TX- Once the home to the notable G.W. Donaldson & Co. Hardware Store. The Root Cellar is known for their freshly cooked meals with fresh herbs, don't forget to try one of their micro brews. The Pie Society in San Marcos, TX- Our favorite local pizzeria and place to get one of a kind sodas. Hays County BBQ- This is our ALL-TIME favorite BBQ spot in Texas! Yes Texas! The Oasis- This is also a bit of a drive, about 45 minutes - 1 hour outside of San Marcos, but I promise you won't regret it. The Oasis sits high on a rocky hill overlooking Lake Travis and the view around sunset is simply breathtaking! Be sure to drive the extra miles into Austin and you cannot miss this bustling Texas city. I highly recommend hanging out in the downtown area - there are so many fun boutiques and vintage shops. You can also visit New Braunfels, TX south of San Marcos, TX and float down the river or visit Schlitterbahn, a local water park that feeds into the Comal River!.